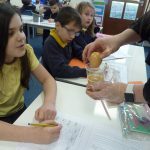 As part of our learning about teeth and the digestive system, Blue Class have conducted an interesting ‘Eggsperiment’ surrounding the impact of a variety of liquids on teeth enamel. 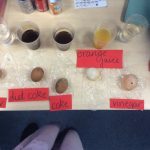 We found out that the shell of an egg has similar properties to tooth enamel and so placed eggs within different liquids (water, diet coke, regular full sugar coke, orange juice and vinegar) to see what would happen over a week. Each day, we recorded the changes to the eggs, seeing some amazing effects. We all decided that sugary and acidic drinks are not good for teeth and how important brushing our teeth is! 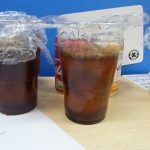 At the end of our experiment, the children wondered what had caused the egg submerged in the vinegar to swell up so much. 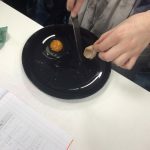 We used a knife to pop open the egg with an ‘eggsplosion’ of vinegar. 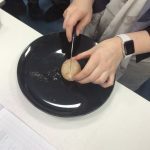 It had absorbed the vinegar – the vinegar had also bound the egg together, meaning we could cut the yolk in two. We have thoroughly enjoyed working scientifically and learned key skills including making careful observations, recording data and reporting on our findings.